Severe cases of varicose veins may reflect underlying saphenous vein reflux (venous insufficiency). In this case, endovenous laser vein therapy (EVLT) is necessary to treat the underlying cause of the varicose veins and spider veins. RGV Cosmetic Surgery & Vein Center offers the most comprehensive and advanced vein treatments to women and men living in McAllen, Brownsville, the Rio Grande Valley, and all of South Texas. What is Endovenous Laser Vein Therapy? Historically, venous insufficiency, which causes leg heaviness, swelling, pain, Restless-leg-Syndrome, varicose veins, skin discoloration and ultimately non-healing leg ulcers, was treated in the Operating Room under general anesthesia with surgical saphenous vein stripping. This procedure has now been replaced by an advanced, minimally invasive procedure performed with IV sedation and local anesthesia in the office. 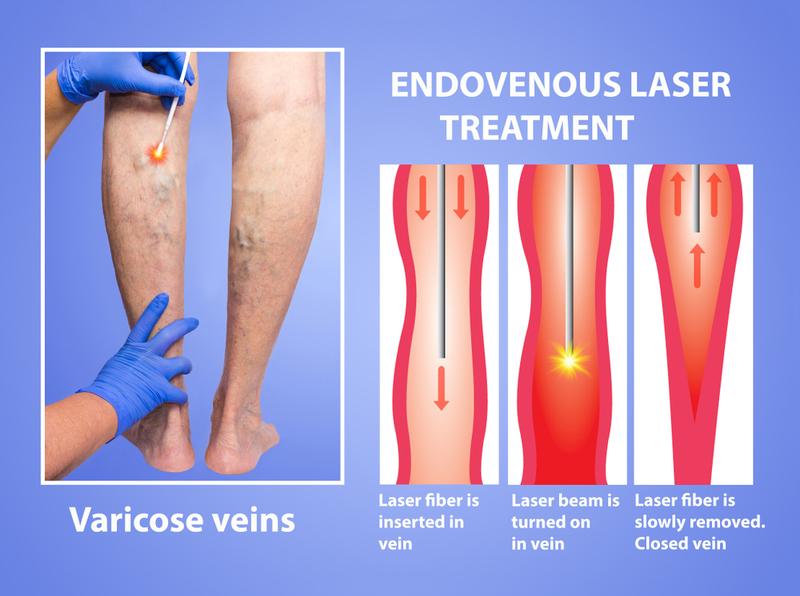 Endovenous Laser Therapy, simply known as EVLT, uses a laser fiber placed inside the diseased saphenous vein to ablate (seal off) the non-functioning saphenous veins if venous insufficiency is diagnosed. The saphenous veins are part of the superficial system of the leg veins (above the muscles), and are routinely harvested to perform heart bypass surgery – so the body can function without these veins. The greater saphenous vein runs from the inside ankle all the way up to the groin to return blood to the common femoral vein. The short saphenous vein runs from the outside ankle behind the calf and empties into the popliteal vein behind the knee. These saphenous veins have one-way valves that help move the blood up against gravity to return to the heart. If these one-way valves stop working properly (due to genetics, pregnancy, or trauma), then there is saphenous vein reflux (or venous insufficiency) and the blood pools in the legs causing the symptoms detailed above. These symptoms improve by sealing off the non-functioning saphenous vein and the blood is redirected to other healthier veins to return to the circulation and out of the legs. EVLT is fast, safe, and effective, and allows patients to proudly show off their beautiful legs again, as well as improve their overall quality of life. Who is a Good Candidate for EVLT? What Can I Expect from the EVLT Procedure? During the procedure, you will be comfortably sedated and then a small laser fiber is inserted through a needle stick in the skin, into the damaged vein under ultrasound guidance. Additional local tumescent anesthesia is then infiltrated around the vein segment to be treated. Once the local anesthesia has taken effect, the laser is fired and pulses of laser light are delivered inside the vein, which causes the vein to collapse and seal shut. The procedure is done in-office. Your leg will be wrapped for one day after treatment. Patients can return to work the following day, and tend to do well with over-the-counter Aleve or Tylenol for any discomfort. How Much Does EVLT Cost? Most insurance companies cover the EVLT procedure. Of course, different insurance carriers have different co-pay and deductible amounts. To determine the cost of your endovenous laser vein therapy, we invite you to schedule a private consultation at our practice. During your consultation, we will assess the severity of your varicose vein disease and determine if there is venous insufficiency with an ultrasound exam. This will allow us to create a treatment plan that matches your unique needs. Then, we will be able to provide you with a clear breakdown of the costs associated with your treatment. At RGV Cosmetic Surgery & Vein Center, we accept a number of payment and financing options, including cash, checks, money orders, major credit cards, and CareCredit® financing. We also offer simple and secure online payment options for the convenience of our patients. To learn more about the EVLT procedure or to schedule a consultation, contact us today. RGV Cosmetic Surgery & Vein Center offers EVLT and other vein care treatments to women and men living in and around the Rio Grande Valley, Brownsville, McAllen, and all of South Texas.